For many Americans, catching up on college football is a tradition during the holidays. Here's how to watch games live on Apple devices, in some cases without footing for an expensive cable bill. If you do have cable or satellite but still want to stream on an iPhone or iPad, you're gold. You likely already have access to every ESPN channel, including ESPNU, as well as other sports networks from Fox and CBS. Some packages include conference or even team-specific options, such as the Big Ten Network or the Longhorn Network. Primary channels from ABC, NBC, CBS, and Fox are also providing coverage. In those instances, you'll probably only need to download the appropriate iOS app(s) from the App Store, sign in, and stream away. What if you're cable-cutter, you ask? That's where things get cheaper, yet potentially complicated. The shotgun approach is to subscribe to an internet TV service. Hulu with Live TV, for example, costs $39.99 per month, and includes access to ESPN, ESPN2, ESPNEWS, ESPNU, ESPN Goal Line, FS1, FS2, NBCSN, and the SEC Network, as well as local broadcast affiliates. YouTube TV, a flat $40, is also pretty comprehensive. You can do much the same with services like PlayStation Vue and Sling TV, though in those cases you may have to pay for specific tiers or packages. While you can probably watch some games on one of Sling's $25 tiers, the safest option is to spring for a $30 College Football bundle. A protip: if you're only concerned about watching a particular game or set of games, all of the big internet TV services offer at least a one-week trial. Time your trials right and you can watch several weeks' worth of football without spending a dime -- just don't forget to cancel before auto-renewals kick in. A low-cost targeted option is ESPN+. It's sports-only of course but costs just $4.99 per month, and even has a dedicated College Football channel. You can watch it on iPhones, iPads, and the Apple TV, just like any of the full-scale TV services. As you may know, we must periodically renew our agreements with TV content providers to be able to provide you with the programming available on Fios® TV. Despite what you may be hearing from Disney, we have been negotiating a renewal agreement to keep their networks, which include those from Disney and ESPN, as well as ABC affiliates in Philadelphia and New York, in our lineup. 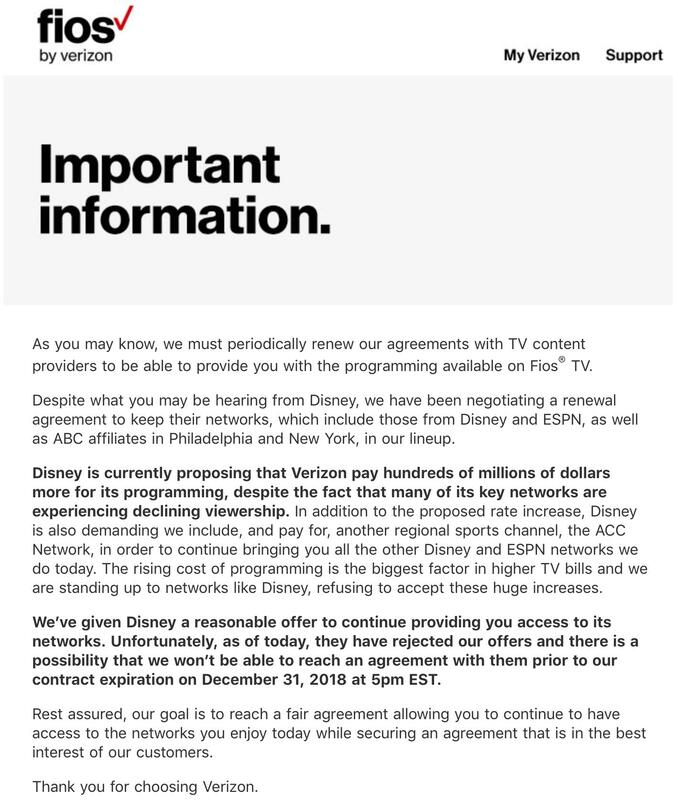 Disney is currently proposing that Verizon pay hundreds of millions of dollars more for its programming, despite the fact that many of its key networks are experiencing declining viewership. In addition to the proposed rate increase, Disney is also demanding we include, and pay for, another regional sports channel, the ACC Network, in order to continue bringing you all the other Disney and ESPN networks we do today. The rising cost of programming is the biggest factor in higher TV bills and we are standing up to networks like Disney, refusing to accept these huge increases. We’ve given Disney a reasonable offer to continue providing you access to its networks. Unfortunately, as of today, they have rejected our offers and there is a possibility that we won’t be able to reach an agreement with them prior to our contract expiration on December 31, 2018 at 5pm EST. Rest assured, our goal is to reach a fair agreement allowing you to continue to have access to the networks you enjoy today while securing an agreement that is in the best interest of our customers. Thank you for choosing Verizon. I've subscribed to ESPN+ since launch and there isn't a dedicated college football channel. You are out of luck if you want to watch any of the power 5 teams. You can only stream the ESPN live channels if you currently have a subscription via cable or satellite. ESPN+ is actually a pretty good deal though. You have access to the whole 30 for 30 catalog and other ESPN original programming. ESPN+ is great if you are a fan of soccer or rugby. There is a ton of content and you can't beat the $5/month price.